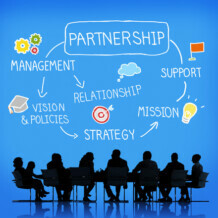 You may not legally need a partnership agreement to enter into a business partnership. But like many relationships, people do not always see eye-to-eye over time and disputes can, and almost always do arise. Without a formal partnership agreement, problems can quickly escalate into major crises. And think of this. If you can’t talk about it now, while your relationship is friendly, you certainly will not be able to negotiate rationally under the pressure of anxiety and disagreement. What will each partner contribute financially? It’s important that this amount be recorded so that there is no dispute when an exit strategy is implemented. Financial contributions might show up as purchases of shares providing working capital for the company, or as shareholder loans, for example. Then there is the method for acquiring operating capital and lines of credit. How will any personal guarantees be handled? Check with your accountant and lawyer on the best strategy for your business. What will the Roles and Responsibilities of Each Partner Be? If this isn’t sorted out from the start, partners will very quickly get in one another’s way and there will be confusion about decision-making jurisdiction. How will partners be paid? Profits are great, but partners need to know how they will be paid personally for their work and how much will go back into the business. How will profits, perhaps in the form of dividends or a return of investment money, be declared and shared? How is ownership and personal use of company property determined and what is included? Hard assets like computers, equipment, buildings and vehicles, for example, are one aspect of the property of the business. Intangibles such as goodwill, client lists, and intellectual property are also assets to be considered. What is a partner allowed to take along in the event of a split? A copy of the client list? The right to use and adapt intellectual property? How about a non-compete clause in your agreement? How will banking, taxes, and accounting be handled? Will the accounting be done externally, or will one of the partners do it? Will there be company credit cards? Who will have signing authority? Each partner should gain enough knowledge to be able to read and interpret financial statements and other management reports, even if it is not specifically his or her area of responsibility. How will the partners resolve disputes? Simply talking it out may not resolve an issue, so the most common method is to use a mediator approved by all parties. What happens if one of the partners becomes terminally ill or wants to leave the company? It’s important that it be decided beforehand how the departing partner will be bought out. Under what conditions can remaining partners sell off the shares to third parties? Should the remaining partners be the only ones allowed to buy up those shares, or simply have first rights to do so? What is the exit strategy? Partners often disagree on how the proceeds should be split in the event of a sale, including if one partner wants to pass his or her shares to a family member either in the estate or as a retirement strategy. Some believe they have worked much harder on the business than the others and deserve more. Planning ahead prevents costly and disruptive situations like these from stalling progress. The Offerer makes a formal offer including the desired price and terms, and the other partner has only two options. 1) Buy or 2) Sell – at that price and with those terms. This keeps both parties honest and avoids costly legal arguments when and if such an occasion arises. This is ideal when there are only two partners in the business. Temper this when there are three or more partners involved. Is it your intent that no one partner may own a majority share? Should there be non-voting shares as well as voting shares. Start with a simple brainstorming session and hammer out an informal letter of agreement first. Shake on it. Then seek legal advice before committing in writing. Why bother with lawyers? They understand the law and how contracts will be interpreted if challenged by another party in the future. A good lawyer can walk you through the possible hidden landmines in partnerships and help you avoid them with a good partnership agreement. It’s an important form of insurance for you and your partners. Specialists in helping Family Businesses and Partnerships make a profitable income and have a valuable asset to sell or pass on to their successors.